H. ‘ Dear Mom’ (Bendig NR) Matt Bendig, one of the young rising stars in hybridizing, offers this selected seeding from his breeding program. ‘Dear Mom’ is a cross of (‘Dorothy Benedict’ x ‘Sea Monster’) x a seedling. Now here is BREEDING potential coming from the originator. Named in memory of his mother. ‘Dear Mom', is reserved to be offered to this auction and other hosta fundraiser events. The successful bidder must agree not to propagate, sell or share the plant without permission. This offer is for a single or better division to be shipped in the spring. H. ‘Gunthers Prize’ is a sport found by Bob Solberg. A special auction was held in the vending room at an AHS national convention. Gunther Stark was simply NOT to be outbid and walked off with the first and only piece of the plant made available at the time. Named by and for Gunther Stark, this sport of ‘Sum and Substance’ has the same growth habits as its parent but exhibits heavily mottled, splashed, and bits of streaking gold, chartreuse and green. Unique and meeting the 20 foot (50 foot!) rule it can be mistaken for NO other. 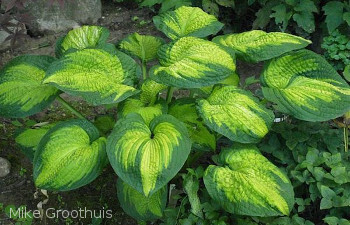 Dan Wols offers a DOULE eye division from his mature clump of this intermittently available hosta. Taking a look at the photo of Dan’s clump at the top, you’ll see that all leaves heavily true to type...it will be a dandy piece! Makes a clump 25” tall and 30” wide. Olga says it better than I can, “This time the hybridizer stepped away from her Americana series for this masterpiece, to be created as a gift for her brother’s birthday. Working with 'H. King Tut’ for the puckering and texture, the result is truly amazing. Brother Stefan has three luscious colors. The center of the leaves have a maple leaf pattern which turns gold in the center, bleeding out to a chartreuse and then edging in deep green. Pure white, tightly packed flowers sit on the top of the plant. H. ‘Brother Stefan' is always the first to catch the visitors eyes. 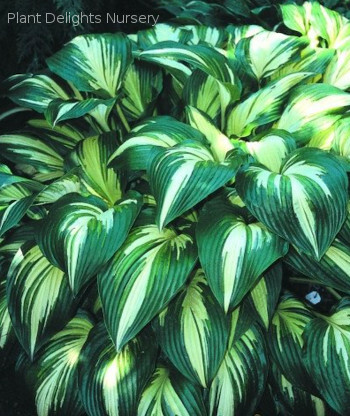 In 2013 Olga received the coveted Eunice Fisher Outstanding Hybridizer award by the American Hosta Society for the best in the U.S. She was asked to name her favorite hosta. That honor went to H. ‘Brother Stefan’.” Futher honors were awarded to this hosta when it was selected as hosta of the year for 2017, voted by the American Hosta Growers Association. This will be at least a 4-5 eye division divided and shipped by the ORIGNATOR, Olga Petrysyn. OS, plus 4-5 eyes representing years of growth … wow! ‘Silver Platter’ (garden name) received a blue ribbon despite not looking its best (a challenge handling very large plants!) at First Look a couple of years ago. It is now too large to dig and haul! It is a seedling of unknown origin (Viktoria has some clues but no certainty). This will be the first division ever to leave Glenbrook Farm. It is encroaching upon the XL range and may yet get there. What is different about ‘Silver Platter’ is the way the leaves do not remain cupped; rather the centers flatten out and the edges curl up. Thence the name. The glaucous leaf reverses still provide contrast. The form is just as shown in the photo: quite upright. Two mature eyes will be shipped to the winning bidder in early May. The successful bidder must agree not to propagate, sell or share the plant without permission. Whether you hear drivn’ a Hot Rod Lincoln sung by Commander Cody and his Lost Planet Airmen in the 60’s or envision clone Commander Cody, a particularly loyal and able leader of the clones in Star Wars, imagine the plant Hosta ‘Commander Cody’. 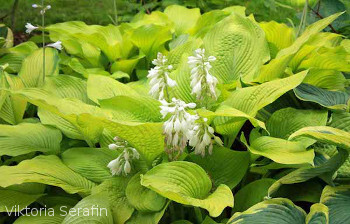 This hosta is an original seedling of the donor, Owen Purvis, is a reliable performer. Highly fertile, it yields a fairly high percentage of streaked seedlings and looks dapper, adorned with its rippled margins and attractive leaf shape. It forms a medium clump with leaves of good substance. Stays fairly stable relative to other such heavily streaked breeding plants. Minimal sharing of this plant makes it a RARE and valuable catch for any collector, lover of streakers, and breeders. The successful bidder must agree not to propagate, sell or share the plant without permission. A one to two eye division is offered, donated and shipped by Owen and Sue Purvis from Elim Hosta Gardens, Princeton, Wisconsin. H. ‘Mito-no-hana’ is a Japanese import that has provided a great deal of discussion in past years. 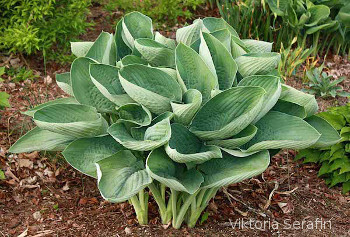 It begs the question, “Why?” Hosta have a knack of puzzling us. Lots of theories and assumptions, but no clear answers. Dr. Lockhart tested it, and it was negative for all known hosta viruses. It is also "impossible" to propagate by tissue culture so it will remain a very rare hosta. As a H. sieboldii descendant, it brings good growth rate to this plant. The yellow leaf venation is most prominent in the early season. Jack Barta of Jack’s Hosta brings us this O.S. donation for spring shipment. Another hosta donated in memory of Phyllis Kedl of Minneapolis, a dear friend now gone for a year and a half, is her ‘Prairie Spring’ (NR). This will be the first release from Glenbrook Farm, although Phyllis may have gifted a division to another friend. A large mound of glowing, golden leaves with good substance and glaucous reverses, it tolerate a fair bit of sun. Good growth rate. A strong, 2 eye, OS division of ‘Prairie Spring’ , believed to have never been sold before, is the offer. Viktoria Serafin, Glenbrook Farm, will ship this dandy in mid-May. The successful bidder must agree not to propagate, sell or share the plant without permission. H. 'Sally and Bob' is a cross of H. 'William Lachman' and H. 'Fascination' made by Clarence Owens of Jackson, Michigan and registered by him in 1994. It was named for a gracious couple, Sally and Bob Murphy from Indianapolis, who were active in the Indy and national hosta societies, Sally particularly in show judging. They were regular attendees at hosta meetings and conventions, including the Winter Scientific in the Chicago area, now called the MRHS (Midwest Regional Hosta Society) Winter Conference. Their garden was considered a showplace for top shelf hostas grown beautifully. What is there about Indiana's soil and climate? 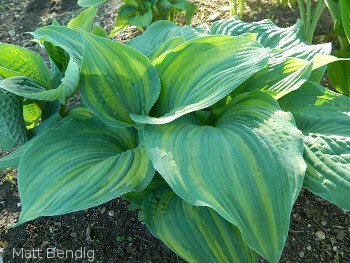 'Sally and Bob' was one of the first GREAT streaked hostas -- and still remains among the top candidates. Green foliage, ~12" x 11", is fascinatingly marked with white and yellow tissue. Eye-catching mount can be 30" across and 18" high. Pinkish white flowers. GREAT BREEDER. Flowers on tall petioles are fertile. Seedlings usually are surprisingly different from each other. RARE. Not usually available. A one to two eye division is offered, donated and shipped by Owen and Sue Purvis from Elim Hosta Gardens, Princeton, Wisconsin. Checking the photo, this is a great specimen with good streaking! H. 'Blue Lightning' is a streaked sport of the classic H. 'Blue Umbrellas' registered by the late Paul Aden in 1978 and now attributed to the late Florence Shaw as originator. Walters Gardens Inc. found it in tissue culturing 'Blue Umbrellas'. Blue-green leaves are heavily streaked with green, yellow and white -- especially white -- markings. Registered by WGI in 2005; named by Amy Begeron, the nursery's greenhouse manager. Leaves are ~10" long x 5" wide. Mound ~24" x 14". Tall scapes, 24 to 36", are streaked greenish blue and creamy yellow. Hugo Philips of Belgium in his database says: "Destined to be offered only in limited quantities, this is...the hot new sport of 'Blue Umbrellas'. 'Blue Umbrellas' was always a great plant in all ways but..it just wasn't pretty! ...Now 'Blue Lightning' is almost too pretty!" RAPID GROWER. Makes a statement in the garden. A one to two eye division of ORIGINATOR STOCK is offered, donated and shipped by Owen and Sue Purvis from Elim Hosta Gardens, Princeton, Wisconsin. This Stone Spirit is a one-of-a-kind ornament for home or garden. There will never be another exactly like him! Many ancient cultures believed spirits inhabited natural objects such as stone, trees, earth, etc. Many of these spirits were considered benign and courted for the protection they were thought to provide. This Stone Spirit was individually hand-crafted by North Carolina gardener and artist, Sandie Markland. It is carved from lightweight featherstone, a type of durable volcanic rock mined in southern Idaho. Featherstone resists weather-related damage throughout each season and will provide years of interest and enjoyment! This piece is approximately 7” high X 12” wide X 12” deep and makes a perfect companion for hostas! Sandie is the owner and creator of items at Windswept Creations. Since each item is handmade it is a one of a kind. Look for Windswept Creations’ tables at national conventions where Sandie often vends. Word of warning, folks know the quality of her work and often make an early stop to see what she has each time she vends. Do not miss out! H. 'Allegan Gent' OS is a great sport of H. 'Northern Halo', which in turn is a great sport of H. 'Elegans' (aka H. sieboldiana 'Elegans'). 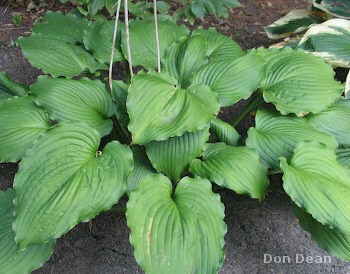 Found by Ken Herrema at Englerth Gardens, Hopkins, Michigan, the famous hosta nursery originated by Larry Englerth. Allegan is name of Michigan county where Hopkins is located. Ken is Larry's son-in law. Englerth Gardens is perhaps best known for H. 'Allegan Fog' with misty green and white medio-variegated leaves that caused a sensation a while back. The late Pete Ruh registered 'Allegan Fog' for Ken in 2000. Its leaves, ~7 1/2" long x 5 3/4" wide, have a distinct white margin that's handsomely GREEN STREAKED. The variegation is most unusual and most attractive, different from other whitish-margined 'Elegans' sports. Clump size is ~24" across and 12" high. VERY LIMITED AVAILABILITY. Not often seen in gardens. Orginator Stock. A one to two eye division is offered, donated and shipped by Ken Ziarek in Delafield, Wisconsin, the noted collector of rare and OS hostas. H. ‘Frilly Frolic’ is a 2015 registration. It forms a flared mound 25" x 59” here when grown in heavy shade (more compact in ½ day or better sun) of leaves measuring 11" x 15”. A blue-green in spring that holds reasonably in heavier shade but gives out to green in more direct sun by mid-season. H. ‘Frilly Frolic’ is not in production and there are no plans to place it into production so supplies are very limited. This is the FOURTH piece to ever be offered and is obviously OS, drawing up to $300+. In order to allow me to continue to use this as a fundraiser for our plant societies the successful bidder must agree not to propagate, sell or share the plant without permission. A double or better division of field grown mature plant will be sent in the spring from Don Dean. Clarence’s H. ‘Indian Feather’ out of ‘Yellow Splash’ makes a 20" tall x 3' wide clump with cascading leaves. The glossy leaves are mostly white for the first few years with a dark green border. The border widens with maturity, leaving a much narrower creamy white center. This one takes some patience to form a mature clump, but Glenn has taken care of some of that wait. Glenn Wilson offers a 1-2 eye division of a multiple year old plant to the lucky winner. Start BIG! Wait, it gets better! Glenn is from Ontario. THANKS Glenn for making the bidding upon hosta easier for all North Americans to place a bid!